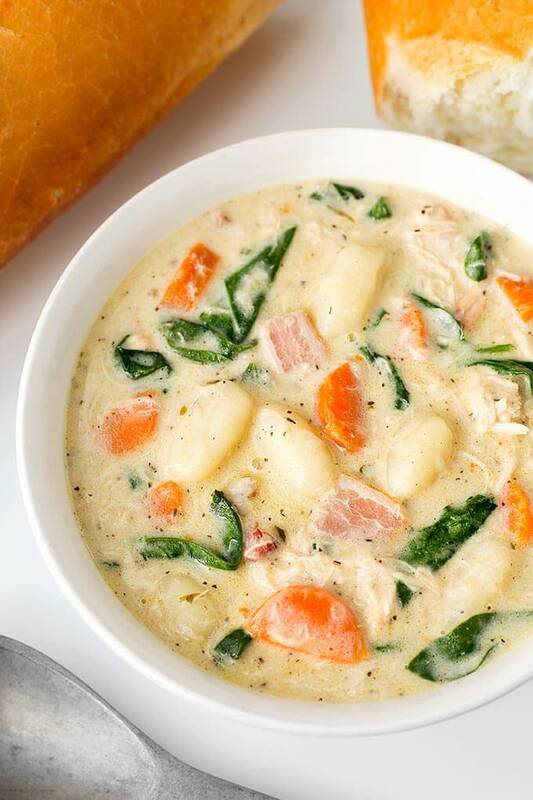 Creamy Chicken Gnocchi Soup is rich and full of flavor with bacon, rosemary, basil and soft gnocchi! This is the perfect Fall soup. Total comfort food. It’s easy to make and goes well with crusty bread! How did it get to be the middle of October?! The summer flew by! My birthday is this month, and those birthdays are coming faster and faster! It was a good summer, and I was able to get a lot of recipes made for the blog! 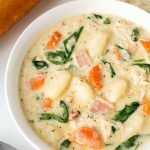 We had a group of guys to feed today, so I made this wonderful, hearty Creamy Chicken Gnocchi Soup for them. It was a big hit! Then we had my Instant Pot Pumpkin Cheesecake for dessert. Yum! This soup has just the right amount of spices and herbs. The bacon gives it the richness, as does the half and half. You can substitute the cream for milk to make it a lighter soup, and it will still have a wonderful flavor. You can use precooked chicken as a time saver. Just buy a rotisserie chicken and shred it into the soup. So easy! Serve it up with some crusty bread and you have a comforting and very flavorful meal! In case you don’t know what gnocchi is (pronounced NO-KEE), they are little potato dumplings that are not quite pasta. You can use gnocchi in any dish that calls for pasta, or in this case as a way to make soup heartier and give it more texture. Gnocchi takes on the flavor of what you cook it in. 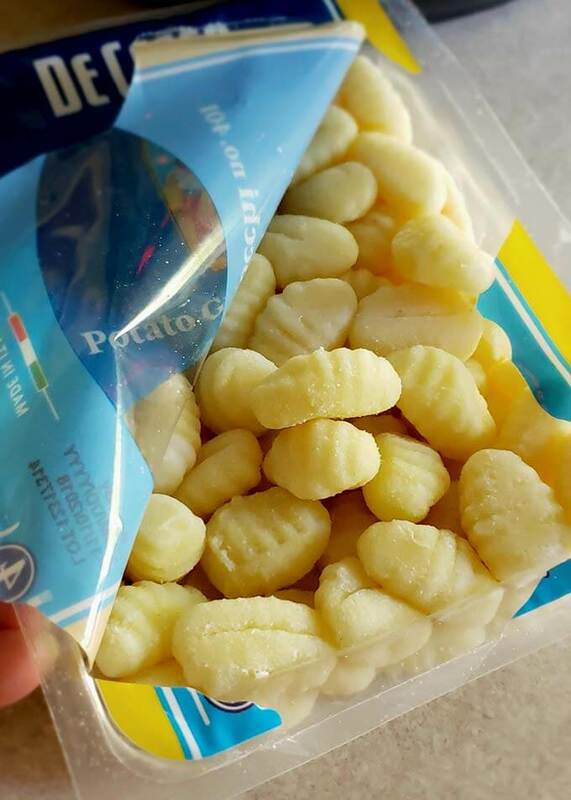 You can find gnocchi on the shelf near the pastas at the grocery store. It isn’t dry like pasta. 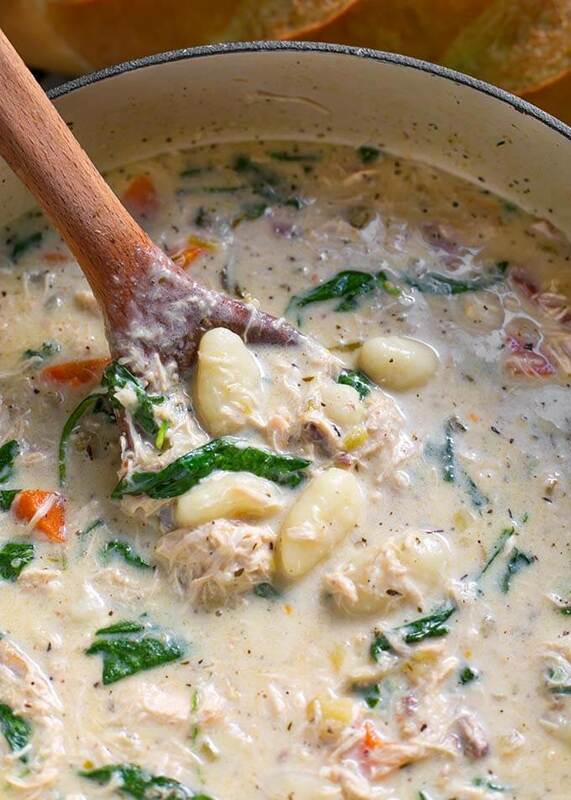 I have had so many compliments on this Creamy Chicken Gnocchi Soup. People just can’t believe how much flavor it has! They also really like the texture of the gnocchi and the tender chicken. I’ve been told this tastes better than the Olive Garden restaurant’s soup that is similar. I don’t know as I have never had it! I will take that as a compliment though. We like the OG. Haven’t been there in a long time though. 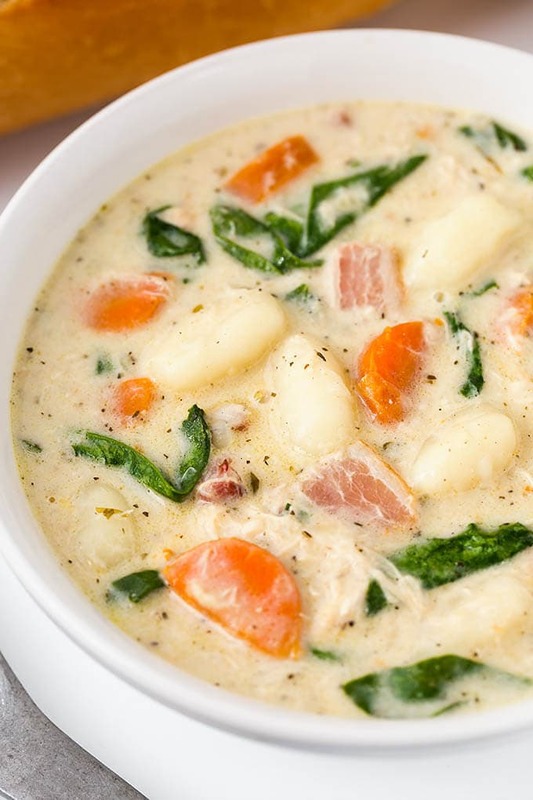 Creamy Chicken Gnocchi Soup is packed with flavor from herbs, vegetables, and bacon. 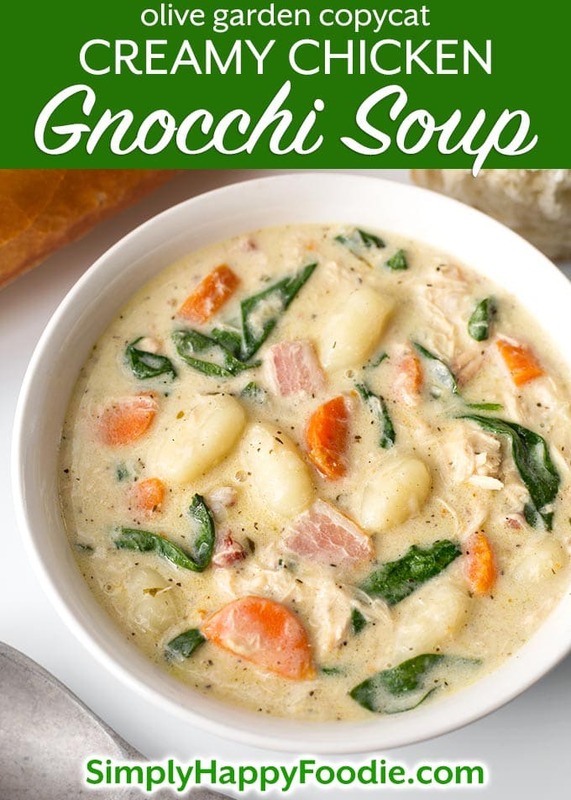 The gnocchi make this a hearty and filling soup. Use a rotisserie chicken as a shortcut if you want! In a 6 quart pot sauté bacon. Remove and set it to drain on a paper towel, keeping the fat in the pot. Add the butter, onions, carrots, and celery. Sauté, stirring occasionally, until vegetables are tender. Add garlic. Cook for a minute, stirring occasionally. Add salt, pepper, basil, poultry seasoning, thyme, and rosemary. Cook for a minute. Add chicken broth. stir. Bring to a simmer. Add the chicken meat, cooked bacon, and the gnocchi. Stir. Simmer for 15 minutes. Stir in the baby spinach. Let cook for a few minutes to soften. Stir in the half and half. Put the lid on the pot and take off of the heat. Let sit covered for a few minutes to warm through. Stir, taste, and adjust salt, if needed. I made this soup and it was off-the-hook good. I used chicken thighs instead of breast and diced the meat prior to putting it in the pot with the other ingredients. It turned out great. That’s great! Thank you, Peggy!